SCVHistory.com RA3301 | Rancho Camulos | Letter Re: August Rubel's French WWI Croix de Guerre, 3-9-1933. 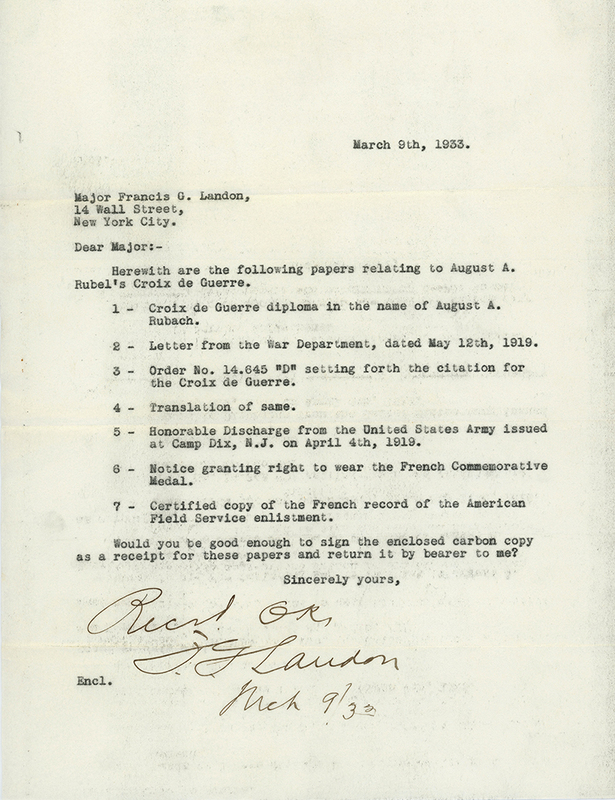 Letter dated March 9, 1933, relating to August Rübel's French Croix de Guerre. The sender and the purpose are unknown. Rübel received one of the 245 Croix de Guerre medals that were awarded by France to members of the American Field Service for bravery during World War I. Rübel served in AFS unit S.S.U. 631. From 1914-1917, the American Field Service was a volunteer ambulance corps composed of college men from the United States (Rübel went to Princeton) who came to the aid of France. The United States entered the war April 6, 1917, and took over the AFS that fall. Thus, as noted in this letter, Rübel was honorably discharged from the U.S. Army on April 4, 1919, at Fort Dix, N.J. He was a resident of New York at the time. Afterward he established a dairy in Santa Paula and then purchased Rancho Camulos in 1924. Assistance given to France took many forms. It ranged from young American men enlisting in the French Foreign Legion to fund-raising and benevolent service activity, such as the Red Cross. The Foreign Legion attracted those who wanted combat, but there were others who wanted to serve in a non-military capacity, especially since Germany and America were not at war. Many of them served as ambulance drivers in France, working for the several organizations already operating hospitals or other benevolent services. This was one of the principal ways in which Americans could serve without bearing arms. The largest and best-known of these hospital organizations was the American Ambulance Hospital Field Service, later named the American Field Service. Besides providing direct non-combatant support to the French Army, the AFS served as a channel through which passed many men who later served under arms with the military forces of France, England, or the United States. Of particular interest to historians is the fact that a special service medal was awarded to each of the volunteers who served with the AFS during the war. In addition, the French awarded 21 unit citations to AFS Sections and 252 individual decorations for valor to AFS personnel. These decorations included two awards of the Legion of Honor, five awards of the Medaille Militaire, and a total of 245 awards of the Croix de Guerre, including multiple awards to the same recipient. Rübel would return to the service during World War II. He died in 1943 when his ambulance hit a German land mine in North Africa. RA3301: 9600 dpi jpeg from original 8.5x11-inch letter (parchment). Rancho Camulos Museum collection.